I believe that each of us has a food that we could eat every single day and never tire of. For Michael, it’s pasta; for me, it’s pizza. I’ve been through several pizza phases in my life. In junior high, you either went to Godfather’s or Monical’s. In high school, the deep dish pizza made the big time and everyone flocked to Pizza Hut and Garcia’s. In college, Domino’s was hitting it big with their delivery service, although the people with cars could go to Noble Roman’s. When I moved to Saipan in 1989, I went into pizza withdrawal since there were no pizza places on island at the time. Saipan residents made two or three trips to Guam every year and the return flights were always full of people who brought back several Pizza Hut boxes stacked and tied together, the scent of tomato sauce and cheese wafting throughout the cabin. And to complicate matters, yeast was hard to come by since it was shipped on a boat from the U.S. and it was usually near expired by the time it arrived on island. In fact, many people asked mainland friends and relatives to mail pouches of yeast in care packages. So my pizza withdrawal forced me to try my hand at pizza dough using a recipe from my Farm Journal’s Homemade Breads cookbook. It wasn’t too bad, although I really didn’t know what I was doing and I remember being frustrated that I couldn’t shape it exactly in a circle. I cannot say that I’ve become a pizza expert, but I certainly prefer to make my own unless I happen to come across a really excellent pizza parlor. This dough recipe from Peter Reinhart’s The Bread Baker’s Apprentice makes a thin crust, although not cracker thin, that has some chew. 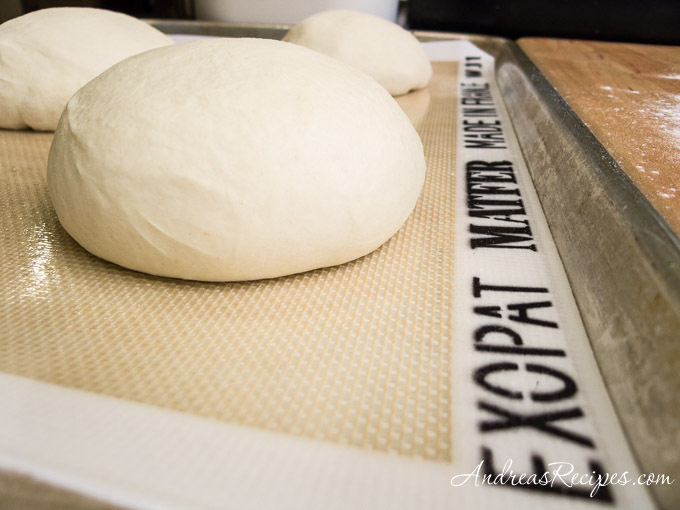 Proofing overnight in the refrigerator helps the dough to relax and makes it easier to work with. The recipe makes enough for up to six pizzas, depending on the size you want, and you can freeze the dough in individual bags for three months. Reinhart’s book has a lot of helpful information, including information on flour, measuring, temperatures, and technique, and I highly recommend it if you want to learn from a master baker. Reinhart covers both hand mixing and machine mixing techniques, and since I use my KitchenAid for mixing and kneading, that is what I included here. Also, Reinhart refers to food grade plastic bags for covering the baking sheet during the overnight proof, but I use a loose covering of plastic wrap since that is what I can get. Adapted from The Bread Baker's Apprentice, by Peter Reinhart. In the mixing bowl using the paddle attachment, stir together the flour, salt, and instant yeast. Add the olive oil and the cold water, mixing on low speed until the dry ingredients are full incorporated with the liquids. Remove the paddle attachment and add the dough hook. Mix on medium speed for 5 to 7 minutes. Dough should easily clear the sides of the bowl but will stick to the bottom a little. If the dough sticks to the sides of the bowl, add a little bit of flour just until the flour clears the sides. If the dough clears the bottom of the bowl, add a teaspoon or two of cold water. The dough should be springy, elastic, and sticky and register 50° to 55° F (10° to 13° C). Sprinkle dough on a clean surface and transfer dough. Cut the dough into 6 equal pieces, depending on how large you want your pizzas. Sprinkle flour over the dough and your hands. Gently lift each piece and shape it into a ball. Lay the dough on the prepared sheet pan and mist the dough with oil. Cover the pan with plastic wrap, allowing some room for the dough to expand. Remove the dough 2 hours before you make your pizza. Dust the counter or cutting board with flour and spray lightly with oil. Place the dough ball on the prepared surface and sprinkle with flour. Dust your hands with flour and gently press the dough into disks about 1/2 inch thick and 5 inches in diameter. Dust with flour and mist with the oil. Cover loosely with plastic wrap and allow to rest for 2 hours. At least 45 minutes before making your pizza, preheat your oven as high as it will go, up to 800° F/430° C if your oven can do it. If you are cooking on a stone, put it in your oven on the floor (gas oven) or in the lower third. If you are cooking on a pan, do not preheat the pan. Shape the pizza (toss method): Generously dust a pizza peel or pan with cornmeal or semolina flour. Cover your hands with flour, including palms, knuckles, and the back of your hands. Gently lift the dough using a pastry scraper to get under it. Lay the dough across your fists and very gently stretch it by bouncing in a circular motion on your hands. If the dough starts to stick, flour your hands again. If you are feeling daring, you can try a full toss. If not, you can use a rolling pin to finish stretching the dough. Lay the dough on the generously dusted peel or pan. The dough should be able to slide around easily. Top with sauce and whatever else you would like. Since this is a thin crust, stick with 3 or 4 ingredients, otherwise the crust will have difficulty baking. Bake for 5 to 8 minutes, turning after 2 minutes to ensure even browning. Remove from oven and transfer to a cutting board. Allow to rest 3 to 5 minutes before cutting. I so wanted pizza tonight. I guess I’ll just have to wait until tomorrow. I usually add honey to my dough recipe and let it rise on the counter for 2 hours only. This recipe intrigues me becasue it’s like ALton Brown’s sourdough bread recipe. Improving my pizza is one of my many food goals. I’ll let you know how I do. I have made this twice now and we love it. Your dough is much lighter than the one I hade been making before. thanks for the recipe, however is it possible to make it without any sugar to activate the yeast? i followed the recipe religiously but had an awful end result since the dough had not risen a bit. Hi Max. Some type of sugar (granulated, honey) is needed to feed the yeast. Check the yeast to make sure it’s not past the expiration date, and also make sure the water wasn’t too hot, which can kill off the yeast. The recipe, as posted, has no sugar in the ingredients… What is the correct amount of sugar for this recipe? I just made this recipe and, knowing yeast needs sugar, decided to add 1.5 teaspoons… Thanks! Hi Letitia. Peter Reinhart does not use any sugar in his dough recipe (that’s why it’s not listed). I recommended adding sugar in Max’s case since it wasn’t rising for him. Personally, I’ve never had a problem with the dough not rising minus the sugar. Adding a small amount of sugar as you did probably didn’t hurt a thing. I’very been making homemade pizza for almost 40 years and this is the best pizza dough recipe ever! I used my food processor instead of the stand mixer because mine is on it’so last leg. I didn’t have high gluten flour but I keep vital wheat gluten in the fridge for recipes that call for high gluten flour. I use your pizza sauce recipe (from your chicago style stuff pizza recipe) so easy and so good!